For the last several years, technical experts have been arguing over how to adapt the currency’s software to allow it to handle more transactions and meet the increased demand. 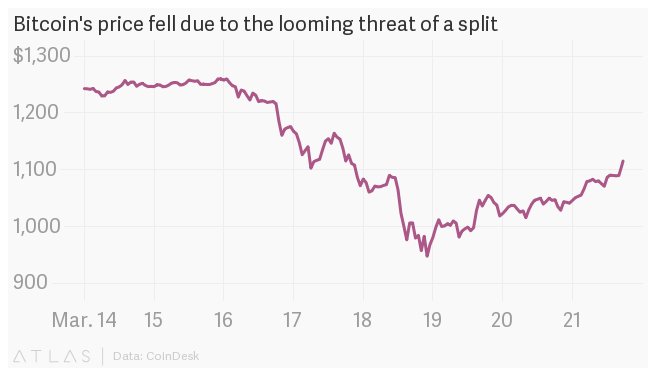 The debate has recently become so heated that it threatens to throw bitcoin itself into chaos, a phenomenon most clearly seen in the recent plunge in bitcoin’s price. … the very real possibility of a fork sent bitcoin traders scrambling to sell their holdings. Bitcoin fell 24% over two days, from March 16, though it has recovered significantly. The issue is that Bitcoin needs change. The debate is over the blocksize, and any change would have technical, economical and philosophical implications. One could argue that this is part of the “growing-up” of the technology but in my opinion, if this constant battle keeps up, Bitcoin’s future seems dismal.